OK, folks, I’m back! I’m going to start out slow and post the simplest recipes I can think of that I keep making each week. As you are waiting for the water to boil, prepare your kale: I tear it off of the stalk as I rinse it, and then place it in a dish pan. Sometimes I rinse it again, depending on how dirty it is. When the water has come to a rolling boil, add salt (about like you would for a pot of pasta) and then put the kale in. I just bring the water back to a boil and then drain the kale in a colander, so basically I guess that is blanching. 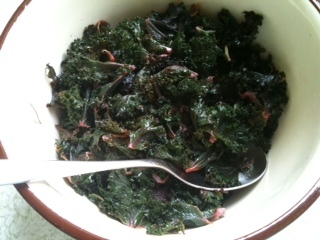 Place the hot kale into a large bowl, and then squeeze lemon and drizzle olive oil over the top. Serve warm or cold. The lemon will discolor the kale, which is unfortunate, but it still tastes good. Until recently, I thought cauliflower was kind of a nothing vegetable that you gave squeamish kids who only eat white food and are afraid of broccoli, but then I learned that it’s actually good for you and it can even be delicious! Preheat oven to 400 and place rack on the bottom. Place cauliflower in a cast iron skillet or baking dish and drizzle with olive oil, sprinkle with salt and pepper, and toss to coat. 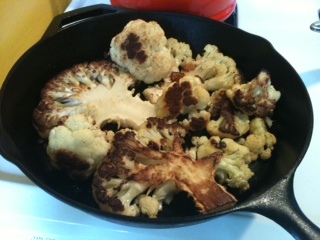 For best results, make sure your pan is large enough to spread out all of the cauliflower along the bottom so that everyone gets equally brown. Place skillet or pan in the oven and cook for about 30 minutes or so, turning steaks and rotating florets halfway through. Serve warm or eat cold for a healthy snack! So glad you’re back, Cynthia! These recipes sound delicious and simple, and I love your writing style. (It makes me feel like we’re having our own conversation while cooking together.) I’ve already told Uncle Bob to buy some cauliflower for us… He may even do the preparations! Thanks Aunt Gen 🙂 I hope you guys enjoyed the dishes. Dan makes fun of me because I always have these in the fridge.